The mobile app industry has evolved. What started with as simple as the Flappy Bird app has now moved on to a time where it is answering to all the human needs (Okay, a lot of human needs). While users’ demands and businesses’ innovativeness have together transformed the mobile application, the process of development remains the same. In this article we will be looking into the answer to ‘How to Build an App’ process followed by app development companies for giving the world innovative and superior quality apps and once that is settled, we will give you a bird eye view of how we develop an app in-house at Appinventiv. Today we will reveal the process that got us from 5 apps to a 700+ apps portfolio in a matter of Three Years. This article will tell you the exact process that we followed when we launched apps that got million dollar fundings to their businesses, giving you an answer to ‘How to Develop a Mobile App’. Can’t wait to find out? Well, we can’t wait to tell it all. Wait. Since all good things come with a little patience, let’s take a quick go through of what all comes to your mind when planning to develop a mobile app through this mobile app development guide, first. Mobile App Development industry, although very vast in terms of the players, follow more or less the same process when it comes to application development. 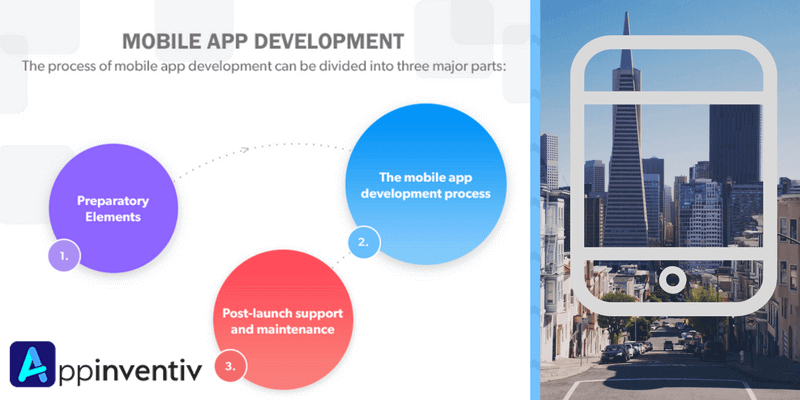 As you saw in the infographic, the mobile app development process is on a comprehensive made up of three parts – Preparatory Elements, Actual Mobile App Development Process, and the Post Launch Maintenance Process. This is the stage where businesses indulge in research. The aim at this stage is to establish the viability of an app idea. And to achieve that, businesses gather an in-depth understanding of the issue that are seeking to solve, the user demographics and of the competitors that offer similar or a part of the solution that the app is going to offer. After establishing that there is actually an issue that will be solved by a mobile app, businesses go out on the search of mobile app development companies. Once the app development is finalized, the actual process starts – Development. When we talk about mobile application development, there are two parts to the process – Front and Backend. The process is followed to develop what would be shown to the app users. There are a lot of things that a mobile app developer will have to take care of when designing and developing the frontend. The aim of it should be to offer a simple experience with very less learnability curve. Also, it should be perfectly in sync with the backend to handle the to and fro of information easily. This is the most crucial part of the whole mobile app development process. The more robust your backend is the more powerful your app would be. The backend should be designed and developed in a way that supports scalability and easy management of the app even after it’s launched. It is not uncommon to assume that the work finishes after the app is developed. Although it is too far from the truth. Post app launch maintenance is an activity that calls for equal time and effort as the actual development process. As businesses, you will have to ensure that your app has been accepted and is loved by millions of the users on the application stores. And that only be guaranteed when you keep a lookout on how users are reacting to it – if they are asking for updates or bug fixes etc. Now that you have got the answer to ‘How to Make an App’ by seeing what a typical mobile app development process looks like, let us now concentrate on the bird eye view of our, Appinventiv Mobile App Development Process. Our days at Appinventiv are spent interacting with tens of prospects who leave their request to discuss the project query, on our different platforms, and with us finding a sync with at least 1 to 2 of them. Being the leading mobile app development company, globally (Yes, we have the proofs to validate the position), we are frequently asked how it all starts – How the process of Mobile App Development flows from App Ideation to App Maintenance. Full stack – Most of the clients who approach us, come seeking full stack app development services. They are generally looking for a brand that would have a team that is specialized to handle all the elements of an app development process starting from ideation and actual development to app launch and maintenance. A-la-carte stages – Every once in a while we get a few clients who need our help with a specific part of the project. Like recently, we got approached by Dominos to help redesign their mobile app. While the occurrence of this is a lot lower than the full stack development requirements, we do get clients asking for a-la-carte services as well. Seeking resources – Another query that we receive is for hiring dedicated resources. Businesses, mostly of more than 1K team strength and a working team of mobile app development experts, reach out to us seeking developers to help expand into a new technology. Our Clients generally come to us with the idea of the kind of app they want to get developed, the users, who the app will be competing with, etc. With the base study already done, the project gets a kickstart. Let us look into the information that prospects come prepared with, in more lines. 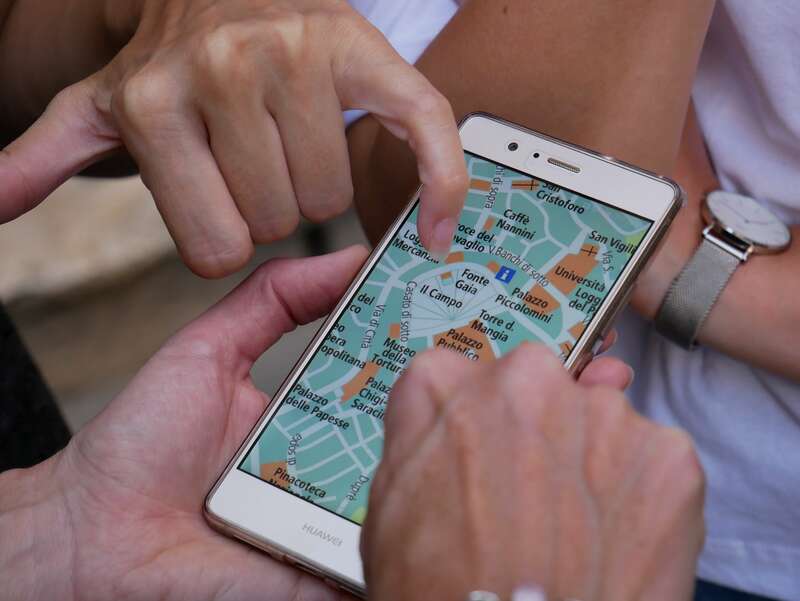 Who are the app users – They know who will be using the app both at a superficial stakeholder level and at the researched user demographics level. They generally do their user demographics study in terms of which geographical area the users belong to, what is their age group, how they use their mobile devices, etc. Basic level of Idea Viability – They usually come after validating that their app idea will be a success and will offer real value to their clients. The idea of the Features the app would have – Our clients know of the features that will be included in the app. Have an initial budget – While our clients might be preparing for seed funding, they have the initial budget to start with the app development process. Know who their competitors are – Our clients know who is the app’s competitors. They reach out to us after doing a preliminary study of the brands their app would be competing with. We have curated a piece that highlights the steps a business should take in the pre app development process, read it here – 9 Steps to Successful Pre-Planned Mobile App Development. The mobile app development process that a typical mobile app development company follows can be divided in three parts – Planning, Development, and Maintenance. Let us see them at a more intricate level. It all starts with a call. After the prospect leave a query on our Contact Us Form with a basic idea of their app, we schedule a call. In the call, we include our pre sales team’s head, who is skilled in the technology that the app will be made on and we include people from the business development team with an understanding of the technology. 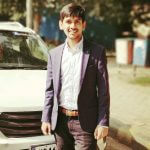 The two definite people whom you will be introduced to are – Prateek Saxena, M.D Appinventiv and Shrikant Srivastava, Vice President of Appinventiv Technology Domain. In the introductory call, our aim is generally to understand the business idea of our client and judge the complexity of their mobile app. What follows the call is an NDA. We sign and send non disclosure agreement to our prospects ensuring that their idea will not be used or shared by us as a suggestion to other business. Once the prospect becomes our client, we create a scope of work. The scope of work consists of a document that consist the detail of the app project – The idea, Technology Stack, and Time it would take to complete the development process. The tech-stack that we mention in the Scope of Work is what ultimately what the whole app development process depends on. The document is near complete idea of what elements would the development process would constitute of. It also consist of the cost estimate of the whole app development. To know how we estimate cost, head on here – How Much Does an App Development Cost. Once the Scope of Work gets a go ahead from the clients’ side, we move on the development process. Since the success of the Agile methodology lies in the active involvement of all the parties who are involved in the a, we include our designers, developers, QA team, and clients throughout the process and the linked iterations. 4.1. Design – We follow Google Material Design and iOS Human Interface Guidelines for making our mobile app intuitive and to incite the intended emotions in the users. 4.2. 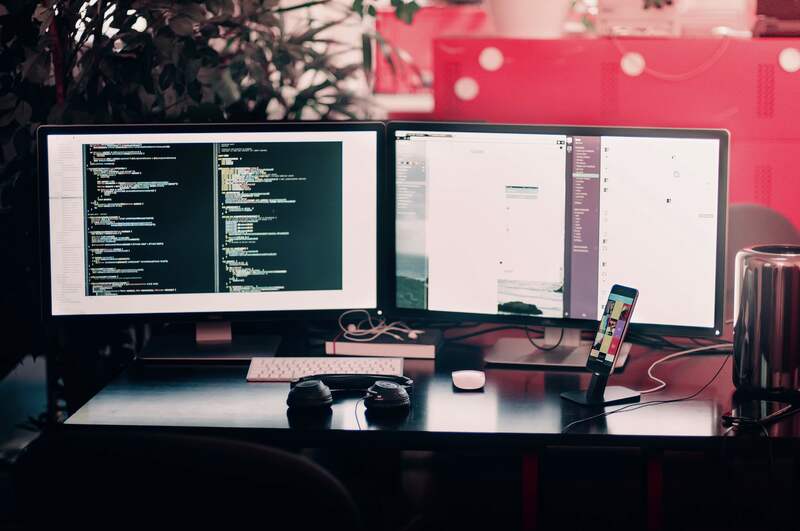 Development – Next, we bring together a mix of technology stacks that are equipped to handle complex app development processes that support scalability. 4.3. Testing – Mobile app testing plays an inherent part in the Agile sprint. Every part of the app that is developed in a sprint is tested there itself. What follows a sprint is an MVP. Following the Agile development process we create a minimum viable product that is now ready to be launched. We then float the MVP among a subset of prospective users and get their feedback. MVP is the one concept that we swear upon. It makes testing an app in the actual ground a lot easier – both in terms of effort and cost. We love the MVP idea so much, that we wrote a guide on it too – The Digestible Guide to Minimum Viable Products (MVP). Upon collecting their feedback, we make the necessary changes in the app using the same Agile process as done at the time of MVP development. After ensuring that the working model of the app is ready according to the exact needs of the client and their end users, we go ahead with the publishing of it on the stores. To make this smooth, we have written an App Store Submissions checklist around it. The last but continued part of our process is App Maintenance. We stick around until we have ensured that the app has been accepted by the millions of users that it was intended to reach in the first place. Have an App Idea? Contact Us Form is Where it All Starts At. Head on there through here.